When it comes to hummus, there truly are 32 flavors and then some. While hummus is always on the menu in my house, I like to shake things up often and try new variations. 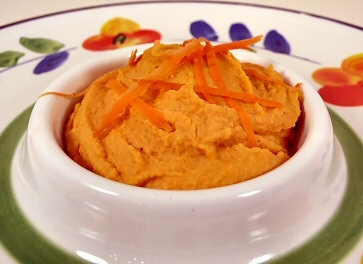 Recently, I was intrigued by the Moroccan Carrot Hummus served up over on 28 Cooks; I didn’t have enough baby carrots to give that recipe a try, but it did lead me to the idea of substituting cooked carrots for part of the chickpeas in my hummus. The result was a lighter, sweeter hummus which didn’t need much in the way of spices to embellish it. In fact, I tasted it after the garlic, carrots, chickpeas, and lemon juice were blended together, and I almost stopped right there: it was so fresh-tasting and delicious that I didn’t want to risk muddying up the flavor with too much seasoning. But I chose to add a few flavors that, I think, complement the carrots; you’re welcome to try the light, unadulterated version first and decide yourself whether it needs any extra seasonings. On the stove or in the microwave, cook the carrots in the water, covered, until the carrots are just tender. (I nuked ‘em for 2 1/2 minutes.) Put the carrots, water, and garlic into the food processor and puree. Add the chickpeas, lemon juice, and salt to the processor and puree until smooth. At this point, you can stop and have a very simple, very light hummus. Or add the remaining ingredients and blend well. Serve as a dip, a sandwich filling, or a salad dressing. Nutrition (per serving): 160 calories, 19 calories from fat, 2.3g total fat, 0mg cholesterol, 638.9mg sodium, 344.3mg potassium, 30g carbohydrates, 6.2g fiber, 2.1g sugar, 6.2g protein. This looks really yummy Susan – I will be trying very soon! I love your variation, and it sounds absolutely fantastic! Must try this one too! I grew up in a very omni, unethnic and well boring household in terms of food. Basically it was steak, tacos or pizza with plain romain lettuce salad on the side for the vegetable. I had never even heard of hummus (or lots of other foods) until entering college last year, which is also whenI went veg. Needless to say, you can now guarantee that there will always be hummus in my fridge. I’m addicted to Trader Joes plain hummus( I also like their spicy and tomato basil, but ususally stick to the plain). I would love to try making hummus, and the hummus you just made looks divine. I can’t wait until I’m out of the dorms and give it a try. I’ve never had carrot hummus before. Although, my aunt brought some artichoke and also some eggplant hummus on easter, and the artichoke hummus was fantastic. Thanks for the great recipe- I always look forward to your blogs! I love this version, Susan! What a great color too. Very orange, I like the looks of it. I think I will look into trying this soon. I have to cook up some chickpeas first though. Hummus is the new pesto … a zillion variations. I noted 28 Cooks’ carrot version too but like the idea of the combination. Availability leads to brilliance! Nice recipe! I used a whole Tbsp of tahini, but otherwise made the “unspiced” version. My DD thought it was too garlicky — but she’s only three, so for her, maybe it was. I loved it. Great color, too. I just stumbled across this recipe and will be trying it tonight. I love homemade hummus, although I usually stick to the plain, garlic, or spicy pepper varieties. Your recipes all look fabulous. So glad I found your site! ohhh – I just made this last night, as the first item in a whole bunch of holiday cooking fun. I can’t wait to serve it to the family and friends! The color is lovely, and the taste is subtle and very refreshing! Thank you so much for this wonderful blog – my new favorite place to hang out online. Wow! I just made this for dinner tonight (stuffed in a wholemeal pitta with grilled halloumi and lettuce. sorry, not vegan!) and it was insanely good. Like a thousand times better than the best storebough hummus I’ve ever had. I used about twice as much ginger and lemon juice as you, and used wholenut peanut butter since I didn’t have any tahini, and everything went splendidly! Thanks so much for this! I always thought hummus required a ton of olive oil to make, but now armed with this, I’m going to make this all the time! just made this and it is wonderfully light, i’m impressed! Hi, Susan! I made this hummus after class for my fiance to take to a company outing/picnic. I didn’t add the spices to keep it bland for the techie employees, but WOW, is it yummy. I love how light and refreshing it is, and almost sweet (yay organic carrots!). I changed the order that I processed the ingredients since I like my garbanzos extra ground, but kept everything else the same. I usually make hummus with gobs of oil and tahini, and this is a very welcome change. I was wondering if you ever experimented with a pumpkin hummus recipe since many recipes call for only 3/4-1 cup pumpkin and the average can holds ~1 3/4 cups so there is always leftover pumpkin. I think you could sub about 3/4-1 cup for the semi-cooked carrots – but what spices would you recommend (it doesn’t need to be bland for us). Lime juice might also be nice instead of lemon juice. and i thought i didn’t like chickpeas ! thank you !! i made this the other night when one of my friends came over and it was delicious. the only problem was, carrots were the only fresh veg i had, so we ended up dipping carrots (and crackers) into carrot hummus! i was thinking how great broccoli would be, if i’d had some! This was just delightful. I think next I might skip the garlic. Also,your hummus recipe looks fantastic. Have to try it this weekend. Cool, I never thought to use carrots while making hummus. Must try! I've been looking at your blog all day at work, and now I'm starving! LOL 🙂 It's a fantastic blog and I've copied many recipies into my go-to folder in my webmail. Thanks so much! I just found this blog and LOVE IT!! I am fairly new to the vegetarian world and was in need of some fresh and funky new recipes. It looks like I have come to the right place! I like this hummus a lot. I think I like it better plain, without the embellishments. It’s a great change of pace when you eat hummus a lot to have something a little different. Delicious! I had carrot ginger hummus at a restaurant a year ago and have been looking for the recipe ever since. We added a little tandoori spices because we didn’t have some of the other things and it tastes great! Fantastic blog you have here but I was curious about if you knew of any community forums that cover the same topics talked about in this article? I’d really like to be a part of online community where I can get suggestions from other knowledgeable individuals that share the same interest. If you have any suggestions, please let me know. Bless you! The Shiny Happy Carrot Hummus was exceptional. A new ETL’er, I have prior to this made hummus from several cookbooks. This carrot hummus surpassed all of them, and my wife enjoyed it as well. Added a jalapeno for heat…minced fine and just turned in the processor at the end. Great in lettuce wrap, with a stick of celery as a support strut. Hello, I would like to know if it’s possible to make a humus with chickpeas flour? I think it’s more easily digestible). Thanks for mentioning that. My older recipes have the old-style points, but I’ve been trying to go through them and remove them. I missed this one but I’ve taken care of it now. good idea with the carrots. i was going to make hummus anyway, maybe i’ll give this a try! This is my go-to recipe when i have a few carrots to use up. There’s no shame in admitting that I usually eat most of it by itself, right? I love that this hummus does not have any oil in it! Hard to find recipes that are oil free sometimes. I want to make this today but, I have no ginger. Do you think that a little powdered ginger will work ok? Yes, but just add it to taste because I’m not sure what amount to tell you. This hummus is very good. I didn’t add the tahini, but did add the coriander and ginger (I think it would be a mistake not to). The carrots make it pretty sweet, which is good. My two-year-old loves it- he doesn’t even want to dip, instead eating it with a spoon by itself. I will double or triple the batch next time. Just made this and LOVED it. Substituted tahini with peanut butter, and it came out amazing! Any ideas of what to pair it with for a sandwich? Made this for the second time! I omit the tahini but other than that keep to the recipe. It tastes wonderful! Wonderful tasty recipes. 🙂 I’m trying to cut the added fat out of my vegan diet. It’s not easy. I normally like to add a lot of olive oil to my hummus spreads, but it’s fattening. Did you know that the word hummus actually means chickpea in both Hebrew and Arabic?